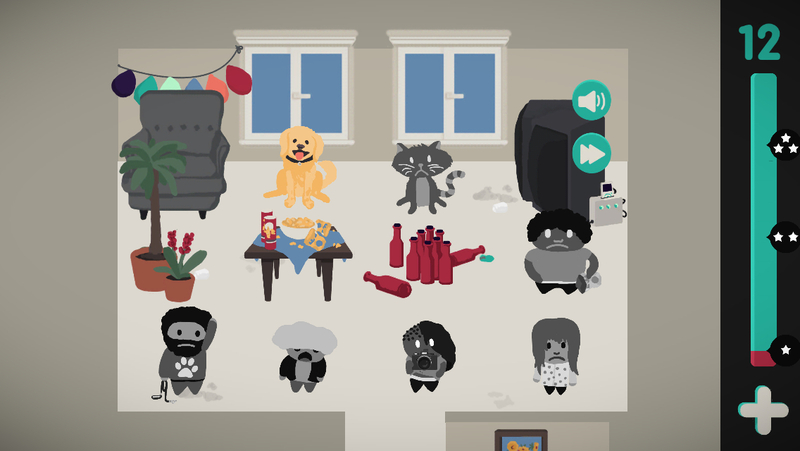 ‘Partyrs’ Review – Who Knew Parties Had Such Strict Rules? Occasionally, a video game has a brilliant new idea that it builds itself around. Sometimes it gets it right the first time, sometimes it’s left to another game to capitalize on it. Most games, however, have to be content with coming at an existing idea, hoping to provide a new angle, presentation, or mix of other ideas to set itself apart. Such is the case with Partyrs ($1.99), a charming puzzle game with a premise that should ring pretty familiar to avid mobile puzzle game fans. It’s a game about arranging guests in a room according to their desires in order to ensure maximum party satisfaction. In practice, it’s very similar to the popular games Girls Like Robots ($2.99) and Joining Hands ($2.99), a puzzle type that stretches at least as far back as those old logic puzzles about ferrying sheep and wolves across the river with one boat. The most interesting spin that Partyrs brings to the concept is to make it feel a bit more organic. While some of the demands of the guests are associated with other guests in some ways, many others want to be near a piece of the background. For example, the fish wants to be in water, and the giraffe usually wants to hang out near the refreshments. This sometimes simplifies puzzles, since it offers a concrete starting point, but it can also complicate things quite a bit as you try to figure out just how everyone needs to fit not just with each other, but with the fixtures as well. Just to give the whole thing a little extra mustard, the game applies either a move limit or a timer on each stage, forcing you to puzzle things out quickly and correctly. As the requests of the guests get more convoluted and the objects in the stages become moveable, the game becomes pleasingly tricky, especially if you want to finish well enough to earn a full three stars on each level. There are some levels where I’m not even sure of how to earn the full star ranking on, to be honest. Although the characters look a lot more natural sitting in their backgrounds than the other games I mentioned, the game is still essentially working on a grid. Generally speaking, the grids are smaller than those found in Girls Like Robots, but the addition of the background elements keep the puzzles from being too simple. Playing the game is very easy, since all you really are able to do is drag a character onto another one to swap their positions, or drag certain background elements, like mine carts, to different places on the grid. It’s sometimes a little fussy, and I’ve had accidental swaps happen a few times, something that’s a little annoying when every move counts. The controls are so simple, however, that it’s rare for there to be a chance for them to let you down. All told, you get more than 50 levels that take place in three different environments, with a nebulous promise of more to come. Once the difficulty starts to ramp up, the levels can take a little while to puzzle out, so it ends up feeling like a reasonably substantial game. It ends at about the right time, too, not overstaying its welcome or dragging out its endgame after all the pieces have been introduced. The game also includes a tiny list of Game Center achievements that range from simple progression-based goals to absolute perfection in every way. If you’re dedicated to checking off the harder ones, you’ll have quite a job ahead of you. As I mentioned earlier, there are a few stages where I could not puzzle out at all how to earn three stars in the allotted moves, so I’m not even sure if the last achievement is possible right now. The other good thing Partyrs has going for it is in its kooky art style. 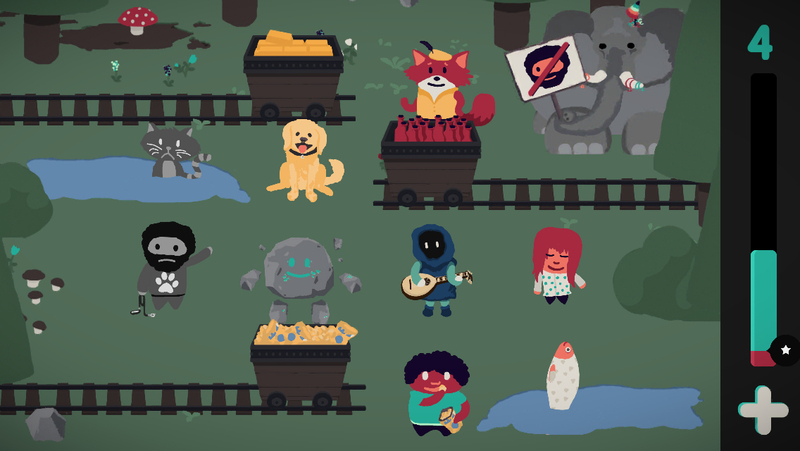 Over the course of the game, you’ll be introduced to a whole bunch of different party attendees, starting off with some slightly strange but relatively normal people before going into wild flights of fancy with anthropomorphic animals, weird creatures, and aliens. They’re all animated in a very simple fashion, but it’s enough to give each one a bit of character. You can even check out which ones you’ve come across in the game’s main menu. The visuals are backed by a piece of music that doesn’t exactly scream “party", but makes for a good tune to solve puzzles to. I’m not completely in love with the overall aesthetic, but it’s certainly unique, and that counts for a lot. If you’ve played Girls Like Robots or Joining Hands and enjoyed them, you should definitely check out Partyrs. It’s not going to surprise you all that much, but it certainly provides a solid shot of puzzle gameplay with its own unique art style and mild gameplay twists. On the other hand, if you didn’t get into similar games, or perhaps got your fill from them, Partyrs might not be your kind of party. Puzzle fans should at least give it a try, however, as it’s winning fans in our forums with its quirky appeal, and it just might win you over, too.